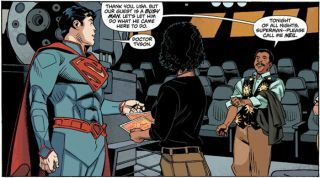 Astronomer Neil deGrasse Tyson helped DC Comics, home of the Superman comics, find a plausible star to be the host of the superhero's home planet, Krypton. NEW YORK — One of the brightest stellar explosions of the 20th century may have inspired Superman's origin story, one scholar says. Nova Herculis — the cataclysmic explosion in the constellation Hercules that captivated the public for several years during the mid-1930s — could have given rise to the superhero's now-famous birth on Krypton. Superman's arrival on Earth is commonly known as an escape from his exploding home planet of Krypton. But this was not Superman's original origin story. In the very first rendition of the comic strip in the early 1930s, writer Jerry Siegel and artist Joe Shuster had Superman come from the future on Earth, and arrive in the present through time travel. In search of an explanation for this shift in storyline, Ricca, who teaches a course on superhero comics and recently published the Superman book "Super Boys: The Amazing Adventures of Jerry Siegel and Joe Shuster — the Creators of Superman"(St. Martin's Press, 2013), scoured through newspaper archives and records of Siegel and Shuster's career from the 1930s. He found a plausible answer in media coverage of Nova Herculis. Superman visits the Hayden Planetarium at the American Museum of Natural History in an issue of Action Comics, cover date January 2013. Ricca pointed out early language from the strip that paralleled newspaper accounts of the exploding star. Siegel described Krypton's destruction, for example, as an "internal cataclysm" that "explodes into fragments" and becomes "rocked by … explosion." While the specifics are not exactly the same, this language aligns closely with newspaper descriptions of the nova. Ricca also pointed out that Siegel appears to have been an astronomy nerd, with records showing that the aspiring writer spearheaded a neighborhood astronomy club at the age of 14. This would suggest that Siegel likely had his eyes on the sky during the Herculis event. This final piece of evidence, Siegel told SPACE.com, helped solidify his conviction that the nova inspired Krypton. The widespread public captivation in Nova Herculis in the 1930s may have helped initially popularize Superman, Ricca believes. "One of the reasons the character lasted so long is that they created it from what was going on around then," Ricca said during his talk. Aside from the Nova Herculis connection, other subtle details resonated with the culture at the time. "It was kind of a cultural Frankenstein. It was the Great Depression, there's a lot of crime, so of course there are characters beating up criminals. He's kind of well-dressed, and he looks like Tarzan a little bit." Follow Laura Poppick on Twitter. Follow SPACE.com on Twitter, Facebook and Google+. Original article on SPACE.com.